"I remember this car very well from my childhood, as it was built and raced by a then very close friend of mine, Ronny Hellquist. In our local club in Sundbyberg, a suburb of Stockholm, we were all very amazed when he showed up with this dual-engined 'Flat-Iron' (as it was shaped like an flat-iron for clothes) some time in 1967-68. It was a true work of art then, and still is. 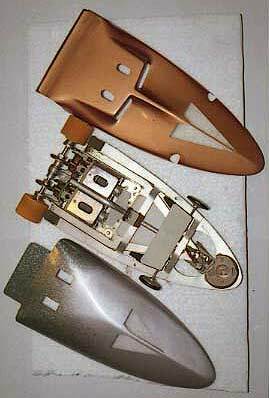 Ronny built each part of this unique 'Flat-Iron', including the significant low and sleek body. The basis was Dynamic motor mounts in the rear, with tailored stainless steel sheet for the rest of the chassis. VERY nice craftmanship, really stunning. Amazingly, the weight up front has remained intact, an old swedish 5-ore coin in copper! (about 1 cent's worth...). This coin was BIG, but has long since gone out of regular circulation here. Old slot racers in my generation (50+) still remember this car very well, and it's still somewhat of a 'cult icon' from the heydays of slot racing, though it's a very long time since anyone saw it. "I've now gathered some more information about the 'Swedish Thingie' and it's originator Ronny Hellquist. I've also actually traced him down and had a nice dinner with him at a restaurant, where we talked about past times in general and this dual-engined 'thingie' in particular. When I, after some detective work, got him on the phone and presented myself, he initially had a very vague memory of me. Remember, last time I saw him was 35+ years ago, I was just a kid and he was an adult man in his early 30's. 35 years later: From my meeting with Ronny Hellquist at a local restaurant. 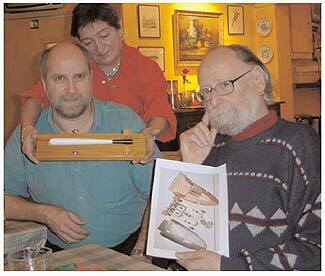 Ronny to the right, holding the picture of his Flat-Iron car. Bertil to the left, with Ronny's friend Maya holding the special 'Nightstick' car, built by Ronny and given to my late uncle as a present on his 50th birthday in 1975. (More on the Nightstick car on page 2). Born in 1939, Ronny is now turning 65 and has been away from the slot car scene for a long time. And he sure remembered his dual-engined 'flat-iron' slot car. Actually, he still believed he had it at home! When I asked him about the car over the phone, he said: "Oh, it's tucked away in a box somewhere in the storage compartment in the basement of my house. There's a lot of stuff from the past down there. I haven't been down there to look for ages." I told him that I had seen the car on the Internet, and at first he wouldn't believe me. Then I described the car with the copper-bronze coloured body, the flat-iron shape, the dual engines and the copper 5-ore coin as a weight up front. And the coin fell down, so to speak. When we met a the restaurant and I showed him the picture, he immediately recognized it. "Well I'll be damned, it's my car all right. Very interesting..."
Ronny had no idea how it had found it's way out of his storage compartment, as he couldn't recall ever giving it away or selling it, or no apparent burglary into his basement storage. But then again, he hadn't been down there for a long time to look. "I made it out of aluminium sheet in a small workshop in the basement of the house I then lived in, very primitive conditions. It must have been in 1966 or 1967. The inspiration was the iso-fulcrum chassis of the then-new Cox La Cucaracha. I used a hacksaw, nibbling tool, and a file to make up the main frame parts. I filed down and glued together two Dynamic brackets with epoxy to hold the two Dyna Rewind motors. 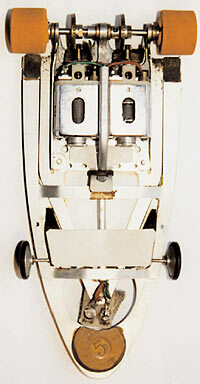 The hinged joint in the rear, connecting the two main pieces of the chassis, were flaps made of rubber and glued to the metal. Simple but effective. The front wheels were attached very loosely, only stuck inside a piece of soft sponge rubber for suspension. A Dynamic guide up front and a 5-ore coin to add some weight, in the rear (british-made) beveled Taylor gears for smoothest possible action. The rear also had a center bearing between the gears, kept for maximum stability. I also think I used Champions True-Lock system for the rear wheels. As for the body, I modeled it to fit the chassis snug - to fit exactly. The mold was made of wood and Plastic Padding, very meticulous job. Put it in a box with a hole in the bottom and a piece of clear lexan plastic taped on top, put it in the kitchen oven for a while and then sucked the body down with the vacuum-cleaner." I asked if the car hadn't been even better with counter-rotation motors. Ronny explained: "No, the Dyna-Rewinds were made to run the best in one direction only, due to the advanced timing of the commutator. The car was fast enough, and held the speed record on every slot car track in the Stockholm area for a long time." That's, in short, the story of the 'Swedish Thingie', a legendary Swedish slot car icon of the past."